Explanation: The Sun's surface is not smooth. It has thousands of bumps called granules and usually a few dark depressions called sunspots. Each of the numerous granules is the size of an Earth continent, but much shorter lived. A granule can only be expected to last a few minutes before dissipating and being replaced by a newly rising granule. In this way a granule acts much like a rising bubble in boiling water. 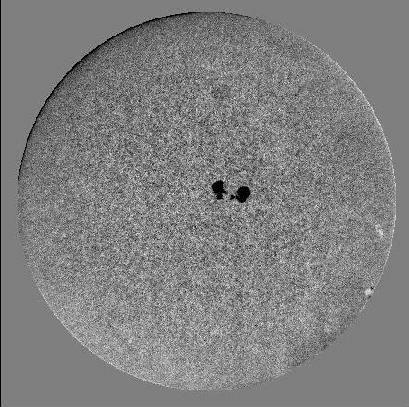 The above black and white, visible-light picture is quite unusual because the usual relative darkening visible near the edges of the Solar disk have been digitally removed. Visible near the center are two large sunspots while the computer enhancement brings out two bright plages close to the right solar limb.